question_answer1) A communication can be ________ or ________. question_answer2) ________ is usually informal and written in a hurry, thus the complete format of a letter is not followed. question_answer3) The idea of writing a _________ is to draw attention to something or some event that would take place. All the required information must be given in a simple, concise, attractive manner so that people notice it. question_answer5) Notice: Informal Communication:: ______: Formal Communication. 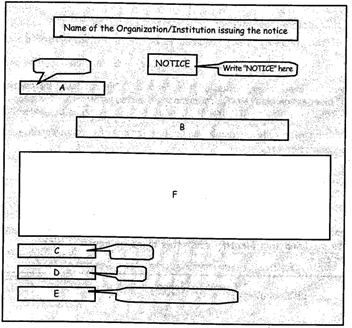 question_answer6) Identification marks should be a part of which of the following notices? question_answer7) Directions: Below is a given the format of writing a message. Identify the alphabets. question_answer8) Directions: Below is a given the format of writing a message. Identify the alphabets. question_answer9) Directions: Below is a given the format of writing a message. Identify the alphabets. question_answer10) Directions: Below is a given the format of writing a message. Identify the alphabets. question_answer11) Directions: Below is a given the format of writing a message. Identify the alphabets. question_answer12) A notice should have a maximum of ___ words. question_answer13) I am an important part of an organisation / institution. You can find me on a piece of paper or on the blackboard/green board/soft board. Can you guess me? Who am I? question_answer14) Read the following dialogue between Ajay and Mr. Khosla, his father's colleague. Ajay wrote a message informing his father about the details of the conversation. Choose the most appropriate answer wherein all the details are duly written and the format is also correct. Mr. Khosla: Hello, can I speak to Mr. Menon please. Ajay: Hello, this is Ajay, Mr. Menon's son. My father is not at home. Can I take a message? Mr. Khosla: Hi Ajay, can you tell your father that he has to be at the advocate's office at sharp 10 tomorrow and he should bring the file containing the company's asset details. Ajay: I shall tell him the details when he returns. Have a nice day, uncle. Mr. Khosla: Thank you, Ajay, it was a pleasure talking to you. MESSAGE 23rd June, 2013 4 pm Dear daddy, Mr. Khosla, your colleague, had called to inform you that you are supposed to be at the advocate's office at sharp 10 in the morning tomorrow. He wants you to carry the file containing the company's asset details with you. I am going to the gym and will be back by 8.
question_answer15) When writing a notice, which of the following things should be kept in mind? question_answer16) Imagine you are the secretary of the Encon Club of your school. Choose the correct notice for informing the school students about the Tree Plantation Drive which your club wishes to organize in the school premises in connection with the Environment Week Celebrations. Gregorian Public School NOTICE 27th April, 2012 The Encon club of our school has decided to organize a tree plantation drive in the school premises as part of the Environment Day Celebrations. The details are as follows: Date : 5th June, 2012 Time : 10 am Venue : School playground Those who are interested to contribute tree saplings should contact the undersigned on or before 1st June, 2012.
question_answer17) In the above question, what is the heading? question_answer18) Read both the statements and choose which one is true. Statement A: Notice is always written in a box. Statement B: A message need not be written in a box. question_answer19) A notice written for some official/non-official meeting should definitely have which of the following? question_answer20) __________ is written in a formal language. question_answer21) Which of the following is not required to be written when writing a message? question_answer22) When writing a message, which of the following things should be considered? question_answer23) Below is a piece of written paper that Pritish put on the school notice board. But some naughty students coloured a written word into red colour. Can you help other students studying this identify what this piece of paper is by studying the format and the content. question_answer24) Directions: Below is a given the format of writing a notice. Identify the alphabets. What is A? question_answer25) Directions: Below is a given the format of writing a notice. Identify the alphabets. What is B? question_answer26) Directions: Below is a given the format of writing a notice. Identify the alphabets. What is C? question_answer27) Directions: Below is a given the format of writing a notice. Identify the alphabets. What is D? question_answer28) Directions: Below is a given the format of writing a notice. Identify the alphabets. What is E? question_answer29) Directions: Below is a given the format of writing a notice. Identify the alphabets. What is F? question_answer30) Choose the correct option of the format of a notice issued for lost and found of an article. question_answer31) Choose the correct option of the format of a notice issued for informing about an event. question_answer32) Directions: Study the notice below and answer the following questions. Who is the writer of this notice? question_answer33) Directions: Study the notice below and answer the following questions. question_answer34) Directions: Solve the following puzzle about various parts of written communication. (Across 1) It is the greetings used in written or non-written communication. It can be formal or informal. Example is "Dear". question_answer35) Directions: Solve the following puzzle about various parts of written communication. (Down 2) It is the core or body which provides with all the important information. question_answer36) Directions: Solve the following puzzle about various parts of written communication. (Across 3) A form of written communication that is written in formal style. It is written to send across a message to a large number of people. question_answer37) Directions: Solve the following puzzle about various parts of written communication. (Across 4) A form of written communication that is written in informal style to send across a message to a single person. question_answer38) Directions: Solve the following puzzle about various parts of written communication. (Down 5) A _______ tells us the immediate objective or purpose of writing a notice. question_answer39) Direction: Below is an example of a notice. Study the notice and answer the following questions. What is the heading in this notice? question_answer40) Direction: Below is an example of a notice. Study the notice and answer the following questions. What is the designation of the writer?